On cuts where bandaids are not desirable or won't stick or if you need to protect wound from environment and environment from wound, this is okay. There is a medical grade product which is the same cyanoacrylate glue but with some additional ingredients that make it flexible and painless on application (Dermabond). This stuff on the other hand gives me 10/10 pain when I apply it. And yes that goes away but not very quickly. It also is not very flexible. I only use when absolutely necessary. Sure wish Dermabond was available OTC. Stops pain and itching of small cuts. Yes, this does burn/sting when you first put it on, but then again so does alcohol or peroxide to clean a wound. It's not that bad, and the results are worth it! Small cuts can be both itchy and constantly painful , especially on the hands where you frequently aggravate the wound by using that body part. As soon as New Skin dries, no more itch or pain! It's truly amazing! Never used it on a large cut so I can't attest to that. I'm allergic to adhesives so this is one of my only options and boy does it burn. I does what it's supposed to but it's extremely painful. Definitely would not use on a child. It also needs reapplied every few hours. New Skin is a must for every household! I had never head of New Skin until this weekend. We were at a family reunion out on the lake and having fun on the jet ski. Until someone got hurt, that someone was my 7 year old daughter. Sometime during the ride she knocked her head one something and cut her head. She didn't know when or how and it didn't even bother her until she wiped her head and saw the blood. My first instinct was to take her in for stitches. But someone had some New Skin and suggested trying it first. So I cleaned it up really well, applied some Neosporin and then the New Skin and a butterfly bandaid. The New Skin burnt like crazy and she didn't want anymore but did let me add more the next day when we redid the bandaid. By the next day, the deep cut was sealed together and it didn't look like it needed a stitch. I am 100% a believer in the New Skin and will keep it in the first aid kit in the house and car from now on. My toddler had a cut on her head from her hair clip when she fell down and bumped her head. With all of the hair on her head, my husband and I took a while to determine what to do while the bleeding stopped. We were told about New Skin by my dad, who said that is what the hospital used on my grandma's arm when her skin tore back. They won't even stitch cuts like this up these day. He warned us that it could sting when being applied. After we bought this, my husband pushed the skin together to close the wound as best as he could, while I applied the product. Our toddler did not even wince. She was completely content as we did this and waited patiently as we blew on it to get it to dry more quickly. We applied it again after the first application dried a bit. The smell is awfully strong, stronger than nail polish. The next day, I wanted to clean it up a bit. The directions state that to remove it, you should apply another coat and wipe off with a cloth. With it being applied to the head, surrounded by lots of hair, this didn't really work at all. It just spread it around the hair. Then I took non-acetone nail polish remover on a cotton ball to remove it from the hair. Several days, baths, and play sessions in the dirt later, the scab was still intact and covered by the new skin layers. Once the scab separated from the scalp, in the bath I gently rubbed with a wet wash cloth to try to break it apart, and eventually, I had to use the nail polish remover to get rid of the rest of the New Skin so that it would come off of her hair. Overall, I was pleased with the way this product worked. Though it was tough to remove in the hair, it probably worked better than any other method would have worked to protect the fresh wound. When you get a cut right on the webbing of your fingers, it is really difficult to apply a bandage that will stay on. Those are the places where New-skin should really be used; this does take a few minutes to dry, but after drying, it will stay on similarly to a standard adhesive bandage. This is pricey, so I wouldn't recommend using it for places where a standard bandage will do. Stings is an understatement it feels like it's burning you. I sliced the palm of my hand a little deeper than a normal papercut and in the past I have always used 'super glue' to close up these kind of cuts, and super glue doesn't hurt and it works great, but I read about New-Skin in a magazine advertisement and thought it probably works better. When I got home and applied it to the cut on my hand I almost leaped out of my shoes. It hurt so bad to put this on my cut. I have quite a high pain tolerance but that was ridiculous. It felt like I was putting acetone in the cut, or worse. I have never had an antiseptic product feel like that. I've been using it for 2 days now and every time I apply it I have to blow on it like crazy to get it to dry because while it's wet it burns like crazy. If it's a sting, then yes, it feels like a bee sting, it's not pleasant at all and I would not put this on a child with a minor cut because that child will scream like crazy. It is not something I'd recommend for children at all. Whether it works good or not has not been proven, I still have the cut and it hasn't healed yet. I do like it better than a band-aid made of cotton and tape. However, the new-skin will peel off if you wash your hands a lot, and trust me, reapplying it is painful. It smells like something that you would not want to put in a cut. They really need to improve this, I wont buy it again. I'll go back to good ol' super glue (which was invented originally for this exact purpose albeit a slight difference in ingredients) which has always worked for me, and never hurts. 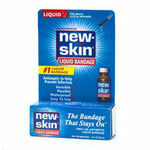 New Skin is the Invisible Band Aid that helps you heal fast! New Skin is the Bandage that stays on. I have always been a Band-Aid user, you know the stick on band aids that we grew up with... in fact I had never heard of New Skin until my husband found it and started using it. I still didn't use it for quite some time. But I had gotten a cut and the band aid just wouldn't stay on because it was on a bend, so here comes hubby with New Skin in hand, he put it on my cut... Ouch! That stings.... but then the sting went away and now I always use New Skin. This stuff works great and helps you heal faster. New Skin is a staple in our medicine cabinet and has been for several years now. We generally buy the small 0.3 FL OZ bottle of liquid bandage that comes with an applicator brush (like fingernail polish), but you can also get it in a spray for larger wounds as well. For those of you who aren't sure what New Skin is... it's a liquid form of a band aid. It has the antiseptic in it to help prevent infections, but it's clear so no one knows you're wearing it. New Skin is also convenient to use on those hard to reach and/or hard to cover areas. New Skin dries fast, forms a protective cover that is antiseptic, is flexible, waterproof and still lets your skin breathe so it can heal. When you first apply New Skin it will very likely sting, because you are medicating a wound, but blow on it to help the stinging go away. It is worth it, the wound will heal faster, plus you're not fooling with those band aids that don't stay on. The smell doesn't bother myself or my husband at all. Active Ingredients: Benzethonium Chloride 0.2% which is a First Aid AntisepticInactive Ingredients: Amyl acetate, benzalkonium chloride, castor oil, clove bud oil, ethyl alcohol, n-Butyl acetate, nitrocellulose. Be sure to read the label and warnings before using. On the surface, New Skin sounds like an excellent idea - instead of reaching for a pesky, wasteful band-aid, pull out New Skin! Simply paint it on, let it dry and you're good to go and protected from infection and further pain. Right? We all have those random cuts - paper cuts, accidents, etc. It's not unusual to think, "how the heck am I going to get a band-aid to stay on here?" You know the cuts I'm talking about. Unfortunately, while New Skin does offer an attractive alternative, it also falls very flat. **How It Works** Directions are straightforward - 1) Clean area2) Apply small amount to affect area 1-3 times daily3) Let dry4) Apply a second coat as necessary Basically, it's a plastic-like liquid bandage that is painted on to your injury instead of applying a band-aid. **The Good** For one, it's easy to apply. It feels like nail polish going on and has a very nail polish-esque smell. It's also nice for hang nails and protects the nail bed from further injury. It's waterproof and really does stay on...for the most part. It's truly like having a second skin. **T****he Bad** Unfortunately, there really isn't a good way to put this. New Skin is a great idea, but there are so many ways that it just fails. 1) Takes time to dry - with band aids you can put them on and head out. With New Skin you HAVE to let it dry. 2) No room for Neosporin - yes, it has an antiseptic in there. That's great! However, it's like drinking Slim Fast pre-made when you could be drinking powder. If I'm drinking Slim Fast pre-made, I don't know what really is being mixed. If I'm drinking Slim Fast powder, I know that it's real milk. Unless you know medicine, it's easy to be misled. 3) Doesn't always stay on - Now, this product sticks to injuries well. That's great for the healing process, but you run into the situation where it doesn't stick to other parts of the skin. With hang nails especially, the New Skin failed to stay on. 4) Not safe around kids - don't let your kids just put this on by themselves. You'll need to call Poison Control if they swallow/eat any ; not exactly a comforting thought when band-aids present no problem at all. **The Ugly** This product stings on an open wound. With a band Aid, you can just put it on and wait until the bleeding stops. 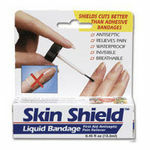 With this product, if you put it on while the cut is still bleeding, prepare for a very strong burn. I have had 40 warts on my hand burned off through freezing and acid - it wasn't a pleasant experience. You can trust me when I say that a paper cut may sting when you get it, but that sting will intensify when you put the product on. Does it work? Sure - but if it's painful to put on in the process, does it really matter? **Summary** While nice to have around, New Skin really should be reserved for special situations - such as hang nails. Don't even try this on your kids at home because the burn will cause them to run away screaming. Do yourself a favor - stick to your Scooby Do band-aids! I know this is supposed to be the best stuff on the planet so I invested in it as a cure-all and must-have item for my daughter's medicine cabinet. This is the kid who won't keep a Dora band-aid on so I was sure that this was perfect for all her boo-boo's that needed covering as a necessity, not a treat to get a cool, character band-aid. I have to say that I haven't used it much. When I have used it, it does the job of covering the area better than a Band-aid, but I have always heard growing up that you are supposed to let injuries "breathe" so I find that my concerns for over-covering the area outweighs the convenience of not using a "real" bandage. Overall I guess I would use this product again especially in hard-to-bandage areas like on the bottoms of my daughter's feet (for a blister, etc) or somewhere similar because it keeps us from having to put real band-aids in places they'll just fall off, anyway.